The 1985 to 1987 Buick Grand National represents Buick’s brief but glorious mid 1980’s return to late 60’s muscle car styling. 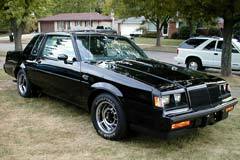 Buick performance revival started with the Turbo Regals, moved to the Grand National and finally the mighty GNX. The first Grand National was made as a mid-size Buick. The model was discontinued in 1983, but reintroduced from 1984 to 1987. In 1988, the Grand National was discontinued after the introduction of new front-wheel drive configuration. Like its other corporate cousins, the base Grand National featured luxurious interiors with fully adjustable seats. The 1982 model was equipped with a 4.1 liter 6-cylinder engine, although the option to upgrade to a turbo-charged V6 was given to the car buyers. In the 1986 Grand National model, the engine was redesigned by including air-to-air intercooler and a better turbocharger. This boosted horsepower ratings to 235. Available only in black in later models, the used Buick Grand National featured a uni-body steel chassis with a height of 54.6 inches and width of 71.6 inches. 1987 Grand National -- NICE LOW MILEAGE EXAMPLE, ONLY 44K MILES, ALL STOCK, 3.8L TURBO, CLEAN HISTORY!